Impressionism reached its zenith in the hands of Monet, Renoir, Van Gogh and Manet. And travelers who appreciate great art find something emotional about visiting the places that inspired their masterpieces. Whether it’s the wheat fields of Van Gogh’s Auvers-sur-Oise, or Monet’s Chartres, go there and you can’t help but feel that your spirit has been elevated to a higher dimension. But while several towns may claim ownership of Van Gogh, no town belongs to Monet more than Giverny, and the one-hour drive from Paris to the medieval village is an elixir for many. Monet’s home in of Giverny, open to the public, offers an intimate glimpse into his pastoral life. Beyond the house, though, it is the gardens and their floating water lilies that are the signature pastel-hued images of his masterpieces. It wasn’t too long ago when I was swept away by the sentimental beauty of these gardens and it was easy to envision Monet at his easel there, capturing nature with paint. And as I experienced the vibrant colors all about me, I almost felt as though I’d become a part of his celebrated works. But Giverny is more than Monet. 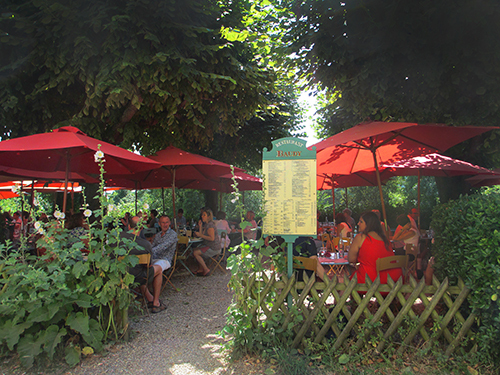 Most tourists who come to Giverny make a “right” to Monet’s house and gardens when they reach the village. But I wanted to step off the tourist track so one day I made a “left” instead. And I’m glad I did. 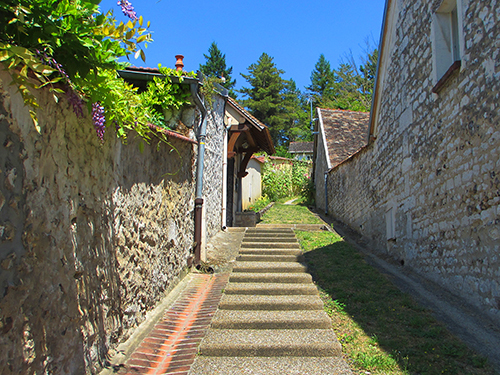 This time I wanted to explore the other Giverny, the village of Norman half-timbered buildings, little pathways and pebble-paved streets, which look much the same today as they did hundreds of years ago. Still mostly untouched by tourists, these little streets connect Chemin du Roy, the main road through the village, to Rue Claude Monet. I began my diversion by making the first of several square routes, up and down named streets and paths with no names. From the public parking lot, I turned left on Chemin du Roy, and made a right on Rue Du Colombier. Peeking down Rue du Milieu from Colombier, I was surprised to find a stretch of narrow road lined with small half-timbered houses. It was all in quiet contrast to the more touristy and crowded Monet home and gardens. I walked down Rue du Milieu, away from Monet’s gardens, and turned right on Rue des Grandes-Jardins, and continued on up to Rue Claude Monet. Just like magic, I discovered a centuries-old little town, filled to abundance with restaurants touting locally sourced meats and produce. Along the way I also passed several small hotels, with eight to ten rooms usually, with names such as La Maison de Mme Baudy and Les Cedres. Although I had eaten lunch only a few hours earlier, I decided some research on Normandy’s locally sourced products was in order. Rue Claude Monet boasted several restaurants featuring local apples and cheeses and I fell in love with Restaurant Baudy. It was bustling and its extensive menu offered a broad selection of apple-based dishes. In deference to Normandy’s apple reputation, I decided to go in and had a glass of cider – which, in France, is “hard” – and a dish of apple sorbet with Calvados. On that hot day, it refreshed my body while the colorful ambiance all about me refreshed my spirit. Afterward I left I found Giverny’s tourism office, la Maison du Tourisme, tucked behind the patio of the Botanic Café on Rue Claude Monet, near a pedestrian tunnel. The office provided free maps and had local products for sale, and I bought a bottle of the region’s famed framboise liqueur. I wanted to mix it with the nightly glasses of champagne my friends and I enjoyed onboard the river cruise ship on which we were traveling. Back onboard that evening, as I reminisced on my day wandering about the village, I knew Giverny had gained a new admirer. And as I looked about the table, saw that framboise had gained many, as well. 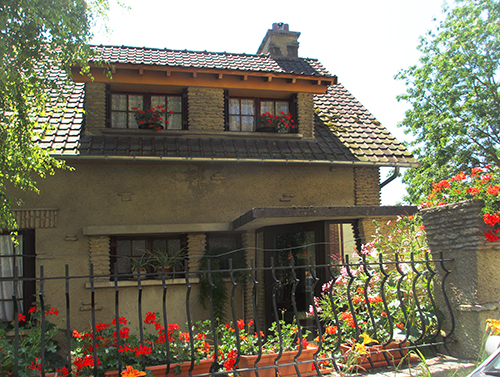 Off Chemin du Roy, Le Moulin des Chennevieres welcomes guests to its Norman bed-and-breakfast inn. It’s rustic and regal at the same time and deserves a look even if you’re not renting a room there. You can read about the hotel, its glorious and tranquil gardens and its cuisine at www.givernymoulin.com/. The Monet-ish Le Jardin des Plumes, with its canopied dining patio, sits at the corner of of Rue du Milieu and Rue des Grands-Jardins. The cheery white hotel with bright blue accents, tucked behind greenery, has eight rooms for rent and has a delightful patio set among trees and gardens. If you’re coming from Paris by train (about a 45-minute ride) you must take the train to the town of Vernon, a few miles outside of Giverny. 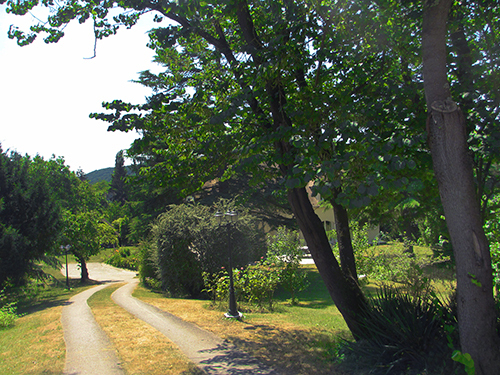 Taxis are usually available around the train station, and, in high season, shuttle buses make the short trip between Vernon and Giverny. You can read more about Giverny, both Monet’s home and gardens and the medieval village, at http://www.giverny.fr/ and http://giverny.org/. i’ll go exploring with you any time…what a great adventure and photos you shared with your readers…I thoroughly enjoyed your article! Merci, Sandy! …. and if you really DO ever want to “explore” with me, let me know! Donna, Donna! So well written and one of my favorite subjects. I took 9 years of French throughout school and Monet is one of my husband’s and my favorite artists. You’ve done a masterful job, mon ami. If you love France, consider a Seine river cruise – Paris/Normandy/Paris. You see Giverny, Auvers-sur-Oise, Rouen …. I have yet to book a client on a Seine cruise who did not love it! Once again, merci! Donna ….